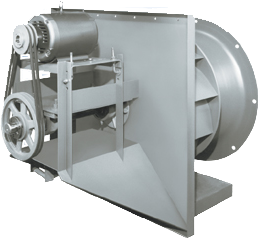 The Peerless Blowers PlugPak PG plug fan is of all welded construction and engineered to simplify installation and minimize maintenance requirements. The PlugPak can be installed in walls, floors, ceilings or plenums and is available for either horizontal or vertical mounting with or without scroll housing. The PlugPak offers non-overloading characteristics with welded steel structural members which increases rigidity and stability of operation while saving space and cost. The basic PlugPak unit consists of a non-overloading wheel overhung on a shelf that is supported by two bearings mounted on an external base. The standard units are designed to operate in temperatures up to 250° F. For temperatures in excess of 300° F to a maximum of 800° F a 4″ insulated plug and heat slinger are available as optional accessories. Wheel diameters from 12-1/4 to 49″ in AMCA class 1 or 2 are available. Wheel diameters 12-1/4 thru 24-1/2″ are flat bladed construction, while 27″ and up are available in either flat bladed or airfoil bladed constructions. The PlugPak fans produce air volumes to 53,820 CFM and 8″ static pressure.